"Moments ago officers arrested five individuals who broke in and looted the Dollar General at 5th & Dawson Streets," the Wilmington Police Department tweeted. "Charges are pending and those details will be released as they become available." "Initially our officers responded to the first one that occurred -- the Family Dollar over on Greenfield Street -- and unfortunately the owner did not want to pursue charges," Cunningham said Saturday, speaking to a handful of reporters, including Wilmington ABC affiliate WWAY. "Later in contact with the owner he reversed his decision, we're working with the DA and charges will be filed. 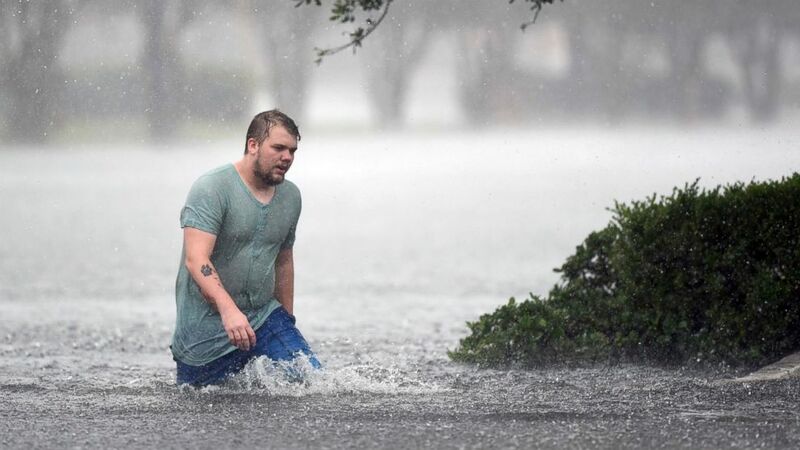 (AP) Jake Head walks through heavy rain from tropical storm Florence in Wilmington, N.C., Saturday, Sept. 15, 2018. "It's important to take a strong stand against looting," he added. "This community has been through a lot right now and we feel very strongly that looters are exploiting people that are vulnerable at a time like this. We need to take a strong stance. The owner agreed with us and therefore it's under investigation." 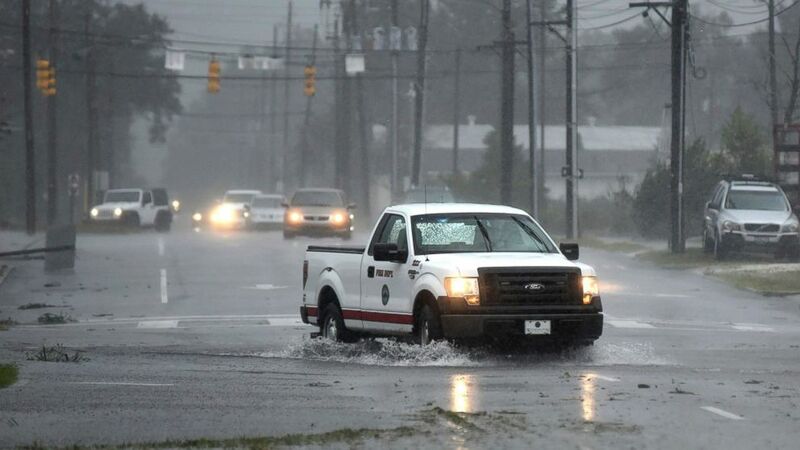 (AP) A vehicle with the Wilmington Fire Department drives through a flooded street from Florence, now a tropical storm in Wilmington, N.C., Saturday, Sept. 15, 2018. "We were [expecting this to happen], we had some units in the field last night and there will be units in the field going forward," Cunningham said. "Looting, unfortunately, is the type of situation that happens sometimes when disasters occur, so we're aware of it and taking measures to confront it." Hurricane Florence came onshore at about 7 a.m. on Friday morning as a Category 1 storm with winds of 90 mph. Wilmington received 9.58 inches of rain on Friday alone, a daily record by almost 4 inches. It received another 3.26 inches of rain on Saturday -- and 1.5 inches on Thursday as the outer bands lashed the state -- to reach 14.34 inches total from Florence. The city usually sees 4.09 inches for the entire month of September, according to the National Weather Service.